Eliza is secretly LadyConstilation, the author of the very famous webcomic Monstrous Sea, nobody knows that it’s her except for her family and two online friends. She plans to have this as a secret forever. Then she meets a Montrous Sea fan in real life, not just a fan but one of the top fanfiction writers on the fandom—Wallace, who she becomes friends with. But when Eliza’s secret comes out, everything she worked so hard for falls apart. Eliza is living a double life. Offline she’s this quiet and weird girl who likes to draw but online she’s the genius behind the phenomenal Monstrous Sea. I really connected with Eliza because I’m also a quiet girl who keeps things all to herself, and she has online friends who she haven’t seen in real life yet and while I have seen may friends physically but I also talk to them online all the time that’s why I’m on my phone constantly. So yes, her character was really realistic and relatable, it’s not hard to care and root for her. For the love interest we have Wallace who is an absolute cinnamon roll, he’s quite alike with Eliza because he’s a quiet guy who doesn’t like speaking in public. He actually writes notes to Eliza all the time except when they’re alone together. He’s nerdy AF and a huge fan of Monstrous Sea. I know they’re like the ultimate OTP. The romance was well-paced, there was no insta-love and we saw how the two formed a bond together. It was the perfect balance of friendship and romance, Eliza and Wallace complemented each other well. I love the fandom aspect of this book, it was like the book Fangirl by Rainbow Rowell because it included excerpts from Monstrous Sea and some fanfiction that Wallace wrote. I am in awe with the talent of Francesca Zappia because she did not only wrote an amazing book but some amazing artwork as well. It was a shame that I read this through an e-reader but I’ll definitely be getting myself a physical copy soon. Hopefully just like in Fangirl, we’ll get the chance to read Monstrous Sea by itself. What I loved about this is that it was so real and raw. The characters were beautifully flawed. I could see how many teens will relate to Eliza and her struggles. This had a great family aspect, I actually teared up on a scene with Eliza and her brothers, it showed that we are sometimes too busy feeling like the whole world is against us that we don’t see that some people are actually there for us. Her relationship with her family was very strained and I love how she was learning to open up to people by the end. The next paragraph kind of contain some spoilers (it’s not detailed but read at your own risk), so just highlight the text if you want to read it. Like I said the characters were flawed. Towards the end Wallace’s actions kind of annoyed me and I basically hated him but I realized that how he acted was very realistic. Eliza was struggling and we could see that she her mental health was on the line but Wallace kept pushing her, I hated him for that. On the other hand, I think that’s the reality—not everyone, even your significant other, would directly see that you’re fighting a war inside of you. People will not see how much you are not okay anymore unless you let them. I think that the author did a great job showing this. 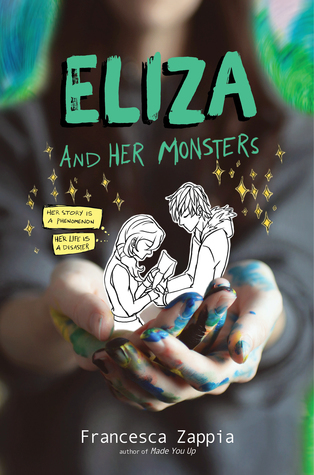 Overall, I enjoyed Eliza and Her Monsters very much. Eliza’s story is one that a lot of people will relate to, it’s filled with fandomly love and a lot of sweet moments. Definitely recommending this to everyone and you know…JUST READ IT! A huge thank you to HarperCollins International for providing me an eARC of this book. This sounds delightful. Added to my TBR. Great review! I’m so excited to read this book, and your review made me even more pumped! I’m glad you enjoyed reading it! Hi there! I’m so sorry for the late reply, I hope you’re enjoying your time here in the blogging community.